Vitamin C is perhaps the most popular vitamin known to man. It is consumed in a supplemental form by millions of people across the world for its antioxidant properties, which are well-documented in medical research. 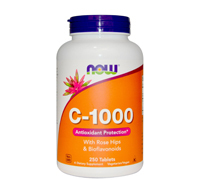 C-500 provides a potent dosage of this key vitamin and is blended with Rose Hips, a natural source of Vitamin C and a synergist.